Wartime pigeons have been remembered in different ways. After the First World War, in 1936 Lille had memorialised 20,000 serving and dying pigeons (as noted above and below)and in Brussels too a monument to the ‘pigeon soldier’ was created. In the Second World War , as a result of Operation Columbia, an intelligence service run from April 1941 to September 1944, there were later monuments in Britain due to pigeons’ involvements in the Second World War. Thus Mary of Exeter, a pigeon who arrived home from ­Europe with rips to her neck and the right of her breast, having been attacked by a hawk. She received seven stitches and survived. Another pigeon, Winkie, played a crucial role in the rescue of a bomber crew stranded at sea. Winkie had been on the flight as well, and after the plane went down she escaped her container, wet and bedraggled, and made her way home—a flight of some 120 to 140 miles. Upon her arrival, the RAF was able to piece together from her ­condition the clues it needed to pinpoint the missing crew’s whereabouts; rescue aircraft found the men ­after a 15-­minute search. Unlike pet budgerigars, pigeons were allowed to be fed. As I discussed in The Great Cat and Dog Massacre, the government specifically decided to suspend the import of bird seed aimed at budgerigars , because of the U-boat attack on food conveys in the Atlantic. This led to the killing of many pet budgerigars unable to survive on rough food such as dandelions. Many thanks. Very interesting. Great recognition of and tribute to birds in the war effort. 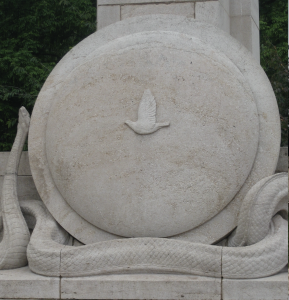 Any reason why there seems to be snake/ cobra at the bottom of the monument? Thanks. 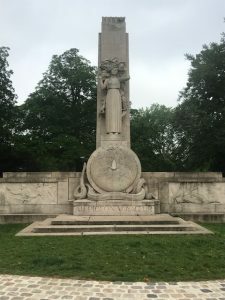 It is stated that in 1936 the French Federation of Pigeon Fanciers erected this memorial at the entrance to Lille Zoo ‘to the 20,000 pigeons who died for their country’ and also ‘to the pigeon fanciers who were executed by the enemy’ for having kept them. The stone monument comprises a personification of Peace surrounded by a flock of birds while at her feet lies a shield, bearing the image of a pigeon. It is resting on a writhing serpent that symbolizes the enemy.